YORKSHIRE first-team coach Jason Gillespie has said that criticism of the club’s T20 form helped spur them into the quarter-finals. Yorkshire looked dead and buried halfway through the group stage when they were bottom of the table after one win from seven matches. But they won six of their last seven to book a quarter-final against Glamorgan at Cardiff tonight (7pm). “Everyone was writing us off and saying that we were a poor T20 side,” said Gillespie, “but that certainly wasn’t the case. “We certainly had the belief, and that kind of spurs you on a little bit when people question you. “It’s almost a stick-it-up-’em kind of mentality. “We’re all happy to cop criticism, that’s fine. “We certainly weren’t performing at the level that I knew we could, which was the most frustrating thing, but I’ve always had the belief that we’ve got the players who can get the job done, and they’ve shown what they can do. Yorkshire are favourites tonight and remain on course for an historic treble of T20, County Championship and One-Day Cup. But Gillespie is looking no further than tonight’s contest as Yorkshire look to secure their place at ‘Finals Day’ at Edgbaston on Saturday week. “It would be fantastic to get through, but we can’t look ahead,” said Gillespie, who led the club to their solitary ‘Finals Day’ appearance in 2012, also at Cardiff. “We can only look at this game in Cardiff and focus on that. Gillespie is back on familiar ground tonight, having finished his career with Glamorgan in 2008 after leaving Yorkshire the previous year. He is looking forward to catching up with some old faces, including Jacques Rudolph, the Glamorgan captain and his former Yorkshire team-mate. “It will be nice to see Jacques again,” said Gillespie. “He’s a great lad and he’s got a lot of good friends in our dressing room. “We’ll be looking to take his scalp because he’s a quality player and, hopefully, we can knock him over. “I know quite a few people down at Glamorgan, and it’s a fantastic club. Rudolph played for Yorkshire from 2007 to 2011, scoring 5,429 first-class runs at 52 and 3,090 List A runs at 59. 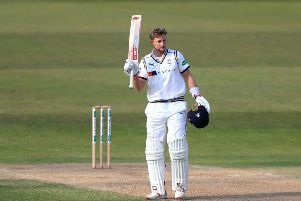 The South African commented: “I was very happy to play for Yorkshire a few years ago, and they’re obviously a big club. “It’s my first game playing against them since joining Glamorgan, so I’m definitely going to give it my best. This is the first meeting between the counties in T20 and their first meeting in any competition for almost three years. Their respective paths have not crossed due to the geographical and, it has to be said, cricketing divide. In stark contrast to Yorkshire, the back-to-back champions, Glamorgan are rock-bottom of the Championship Second Division, while they also made no impression in the One-Day Cup. They finished second in the T20 South Group with eight wins from 14 games, South African Colin Ingram leading their run-scoring charts with 486 at 44, and Australian-born Dutch international Timm van der Gugten, a right-arm pace bowler, topping their wicket-taking list with 17 at 14. “Since my time coaching Yorkshire, we’ve only been to Cardiff for ‘Finals Day’,” said Gillespie, who is coming towards the end of his fifth season at the helm. “We’ve just found ourselves in different divisions to Glamorgan, so we don’t know a lot about them, or as much as we know about other teams, but we’ve been doing our research and looking at how they’ve played T20. “We have to make sure that we do the things that we do well really well, and, hopefully, we can take care of business down there. The trip to South Wales has begun a gruelling period on the road for Yorkshire, who face Lancashire in the Championship at Old Trafford from Saturday. They then head to Canterbury for the Royal London Cup quarter-final against Kent a week today before the potential trip to Edgbaston for ‘Finals Day’. Yorkshire then play successive Championship matches at Scarborough and Southampton before their next game at Headingley in early September. Yorkshire (from): Bresnan, Carver, Gibson, Hodd, Leaning, Lees (capt), Lyth, Patterson, Plunkett, Rafiq, Rashid, Rhodes, Waite, Willey.